Just got back from my travels around Laos, Cambodia, Vietnam and Burma - quite a packed itinery, but made easier by taking (and surviving) 7 regional flights. 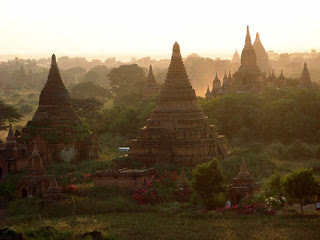 I had a great trip, particularly in Burma which is like stepping back in time 100 years. They don’t use credit cards at all and only accept US dollars in cash for everything. Luckily I found that out a few hours before I arrived as I almost landed with only $10 in my wallet... There are hardly any tourists, the men all walk around in skirt sarongs and the women and kids all wear bright yellow tree-bark makeup. The country is under tight control of the Burmese military government - most websites (including email) are banned and International phone calls are over US$6 per minute, so you're really cut off from the world. There are regular power outages, the roads are awful (had a very bumpy time on a 17hour bus journey..) and most people live in wooden huts. In spite of all that, the culture is fascinating, with a mix of Burmese, Chinese and Indian people living there. I travelled up to Bagan, which has over 2000 beautiful temples and pagodas in a valley the size of Manhattan island, which was stunning. I highly recommend a trip to Burma! Laos was fun too. I went kayaking with a friend over rapids and we managed to overturn it over some rocks. I had to float down the river quite a distance before being able to catch up with it but luckily i didn’t swim into any rocks. I came pretty close to sinking though, since I was wearing a full set of clothes and wasn’t wearing my lifejacket (I really should be more careful). Unfortunately my camera didn’t survive that experience, so my photo taking was limited. I took 2 flights with Lao Airlines, which I later found out all western organisations forbid their staff to fly on due to it's poor safety record. The British Foreign Office says on its website: "Travel by Lao Airlines is strongly discouraged except on the ATR 72 aircraft and the Airbus 320. Since 2000, there have been several deaths as a result of domestic air accidents in Laos." Unfortunately I did not travel on the 2 'safe' aircraft mentioned.